"To truly observe nature's wonders, you must slow down, relax, and breathe. It's this relaxed feeling of being in the moment that I hope to convey. The beautiful forest and gardens of the South have served as the classrooms of my study of horticulture and art. it is my hope that my work will provide years of tranquility and natural beauty to your favorite spaces." Ben grew up in Birmingham, Alabama, graduated from Vestavia Hills High School, spent 2 years at Auburn University, and graduated from Mississippi State University in 1976. While at "State", he began his study and love of horticulture through his courses in Landscape Design, Horticulture, and Arboriculture. After graduation, he continued this interest while working in the landscaping field and started his own landscaping company in 1984. 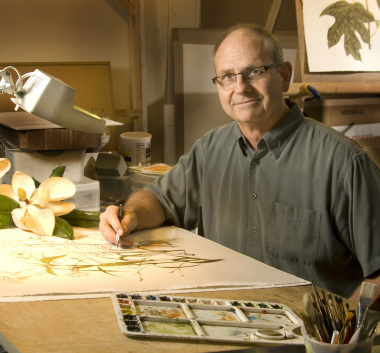 In 1996, Ben began working as a Horticulturalist for the City of Trussville, where he learned an appreciation for the natural beauty and plant diversity along the headwaters of the Cahaba River. Ben entertained his family and friends with silly drawings and occasional paintings. Then his interest in painting turned serious after studying with renowned watercolorist Wayne Spradley in 2000. With new skills, Ben's work accelerated into a full time career by 2007. Ben's originals and limited edition prints are available at Richard Tubb Interiors in the Dr. Pepper District of Birmingham. See Richardtubbinteriors.com. His work has been seen in issues of Birmingham Home and Garden, Southern Living and B Metro magazines.